August is just around the corner. Before you know it, the San Benito County Fair will be here. The first weekend in October, by the way. So, if you're planning to enter sweets, jellies, home-grown veggies, crafts, photographs, or other items into the fair, you have all of August to send in your entry forms and fees. 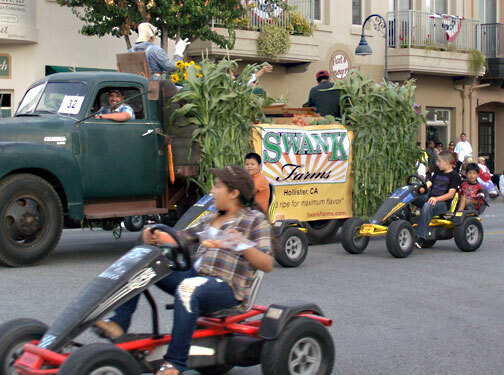 Click over to the San Benito County Fair Web site for more details, after checking out all the fun happenings around the county in August. Wednesday afternoons: Farmers Market, Hollister. 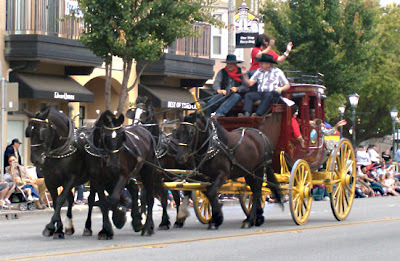 From 3 to 7 p.m., on 5th Street, between San Benito and Monterey Streets. 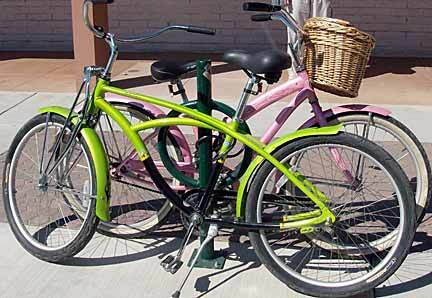 Saturday mornings: Bike Ride with Off the Chain Bikes, from 8 to 11 a.m.
Book Sale, Friends of the Library, Hollister. From 9 a.m. to 12 p.m., behind the San Benito County Free Library, 5th and West Streets. $2 per bag. Saturdays and Sundays: Flea Market, Betabel Station and Outdoor Market, 9644 Betabel Road, San Juan Bautista. 9 a.m. to 5 p.m.
August 7 and 14: Fremont Peak Observatory Evening Public Program, Fremont Peak State Park. August 21-22, 27-29, and September 4-6: Popl Vuh: The Story of the Seven Macaw, El Teatro Campesino, San Juan Bautista. 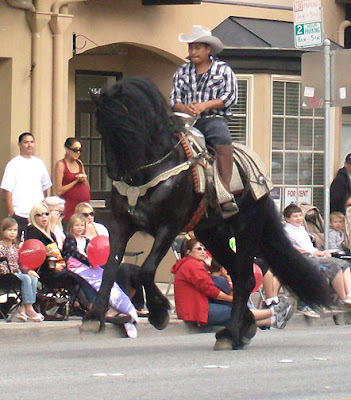 August 1: Corridos!, El Teatro Campesino, San Juan Bautista. August 3: National Night Out, San Benito High School Football Field, Hollister, from 5 to 8 p.m. A nationwide crime and drug prevention event, which will be hosted locally by the San Benito County Sheriff's Department. Annual "Kids at the Park", Dunne Park, Hollister, from 10 a.m. to 2 p.m. A safety and health fair for children and families. 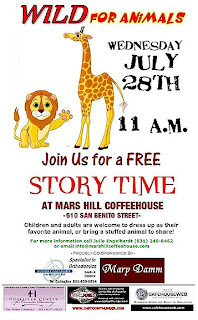 Story Time with Julie Engelhardt, Mars Hill Coffeehouse, 1:30 p.m. Theme is Let's GO! Cars, Planes, Trucks and Trains. "Kids can bring their favorite vehicles--boats, airplanes, cars, etc., and they can dress up like an engineer, race car driver, fireman, policeman...anything they like!" says Julie. August 5: The Lines Tour featuring Colton Saylor and Every Atlas, Mars Hill Coffeehouse, 7 to 8:30 p.m.
August 7: Living History in the Park, San Juan Bautista State Historic Park, 11 a.m. to 4 p.m.
August 8: Annual Antiques and Collectibles Flea Market, San Juan Bautista. August 13 to 15: 17th Annual Good Old-Fashioned Bluegrass Festival, Bolado Park (San Benito County Fairgrounds). August 13: Pedro Card Party, San Juan Bautista. Sponsored by the Native Daughters of the Golden West, it will be held at 203 Fourth Street from 6:30 to 8:30 p.m. Beginners are welcome. Fremont Peak Observatory Solar Program, Fremont Peak State Park, 12 noon to 3 p.m.
San Juan Bautista Gallery Walk, San Juan Bautista, 1 p.m. to 7 p.m.
August 15: Music at the Mission: In Aeternam, Cabrillo Festival of Contemporary Music. 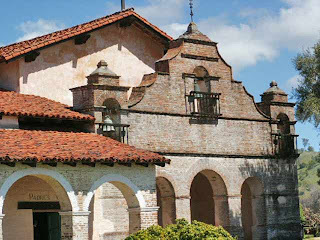 Performances will be at 4:30 p.m. and 8 p.m. at Mission San Juan Bautista. August 20 to 21: Vaquero Heritage Days, Mission San Juan Bautista Grounds (Casa Maria). Monthly Antique and Collectibles Fair, San Juan Bautista, 9 a.m. to 3 p.m.
Shane Dwight and Extra Large Concert, Guerra Cellars Summer Concerts, Hollister. 6 to 10 p.m.
August 27: "Shane," Movies in the Park series, San Juan Bautista State Historic Park. Live Jazz with Luis Lenzi, The Knife and Fork Cafe. 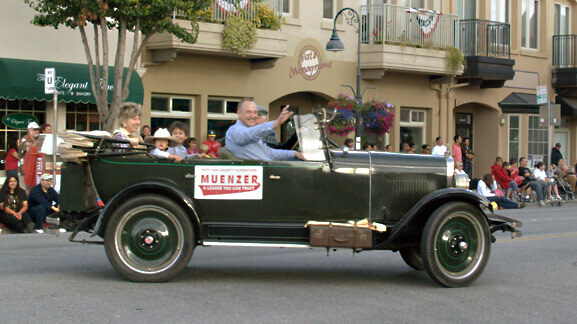 6 to 9 p.m.
"Glamour Hollywood," 3rd Annual Baler Summer Nights Fundraiser, San Juan Oaks. Dinner, dance, and silent auction. 6 p.m. to midnight. August 29: Aromas Day: A Day in the Country, Aromas. A Hollister Biker Rally in 2011? 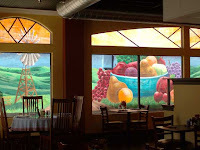 Do you know where this mural is in downtown Hollister? Yep. It's in Wentz Alley on the wall of Johnny's Bar and Grill. Originally painted in 1996, it was repainted in 2007 by artist (and biker) Ronald Rocha from San Antonio. The mural depicts Hollister's part in the American biker history. Some say the American biker tradition began in our sweet agricultural haven on the July 4th weekend of 1947. For years, an annual motorcycle event took place at Bolado Park on the Fourth of July. In 1947, some bikers went into town for drinks and got frisky and loud. Somehow, the media learned about the ruckus and spun the rowdiness into wild and destructive abandonment. You know how that goes with some media guys. They spin things out of context, especially if they can make money out of it. Have you ever seen the movie "The Wild One" with Marlon Brando? That's loosely-goosely based on the 1947 incident. 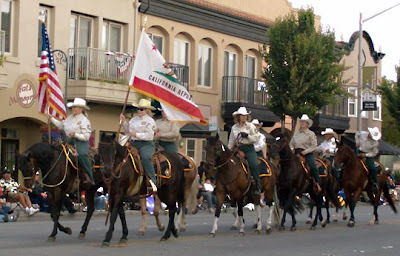 In 1997, the City of Hollister decided to hold a Fourth of July Independence Motorcycle Rally downtown to celebrate the 50th anniversary of that event. It turned into an annual happening that brought thousands of bikers into town. 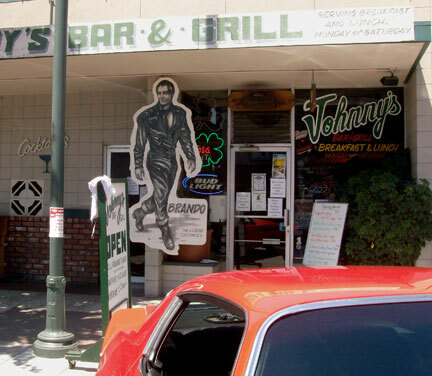 Although it was cancelled in 2009, many bikers continue to visit the area to check out July 4 events held by local motorcycle groups and Johnny's Bar and Grill. There's talk of holding the rally in 2011. Some members of the community plan to address the issue at the open session part of the Hollister City Council meeting on Monday, August 2. The meeting will be held at City Hall, with the open session beginning around 6:30 p.m.
Folks can express their opinions, whether for or against the rally, during the "Public Comment" segment. According to one of the council members, the "Public Comment" segment normally starts early in the meeting. Speakers are limited to three minutes to present their opinions. Council members do not discuss, debate, or take action on any presentations made during "Public Comment." However, they may choose to put the issue on the agenda at a future Council meeting. If you're interested in making a statement about the rally, here is your chance. Help Win a Dog Park in Hollister! Hey Hollister Dog Owners! Want to help Hollister get half a million dollars to give a local dog park a makeover? Tammy Ballew, a member of the Hollister Dog Owners Group, does. Evidently so much that she entered the Dream Dog Park Contest, which is jointly sponsored by Beneful, a dog food brand made by Purina, and WagWorld.com. The sponsors recently chose Tammy as one of the contest's top 10 finalists. Whoo-hoo! Way to go, Tammy! If Tammy wins the contest, she will receive an in-kind donation of $500,000 to renovate the dog park next to the Hollister Airport. Now, here's where all you dog owners and dog lovers can make Tammy be the grand prize winner! The finalist who gets the most public votes for her or his entry will receive 10% of the final score. The other 90 percent of the score will be based on what the judges say. From today until August 11, the public can vote once a day at the Dream Dog Park Contest Web site. So, dear Hollister Readers, let's show Tammy our support. Head over to Tammy's page at the contest Web site to cast you vote. 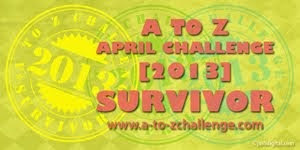 There, you can also see Tammy's winning essay and video for becoming a finalist. To learn more about the Hollister Dog Owners Group, click over to its Web site. What child doesn't love story time? Or, grown-ups, for that matter. I still like listening to stories being read to me or listening to a storyteller spin her tales, which transport me to magical places. Well, guess what, Hollister friends? Story Time is going on in town! 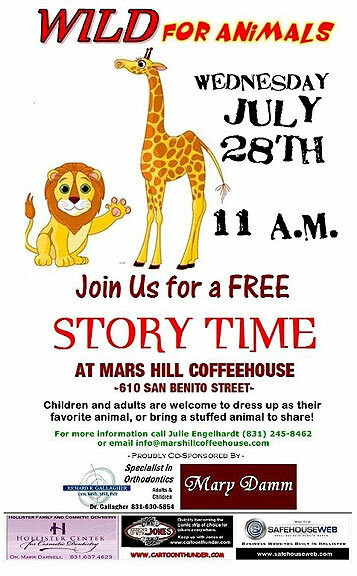 This Wednesday, July 28, Julie Engelhardt will be presenting a Story Time at the Mars Hill Coffeehouse on the corner of San Benito and Sixth streets in downtown Hollister. The free event will start at 11 a.m, and it will last between 45 and 60 minutes. Everyone is invited. Next Wednesday's event will be the second Story Time hosted by Mars Hill. 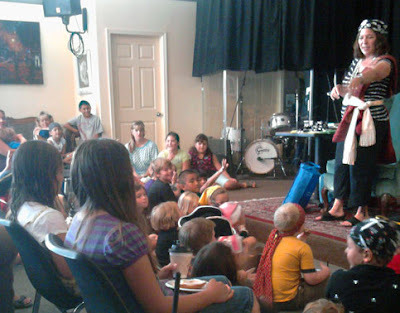 Another is planned for August 4 at 1:30 p.m.
A mother and a professional writer, Story Time presenter Julie enjoys reading to children. Says Julie, "I have two children and I've always volunteered at their schools, primarily to read. My older son is now 17 and attends San Benito High School so that's out, and my younger son is heading towards 3rd grade, so he's kind of aging out of that, too. But, I wanted to continue reading to children, so I began to think of this. Also, there are so few things for families and children in this area, especially things that are free, so I wanted to offer a fun activity for families, daycare providers, or anyone who loves to hear stories!" Julie acts out stories, sings songs, and does finger plays to bring the children's books that she reads alive for her audience. She centers each Story Time around a theme. 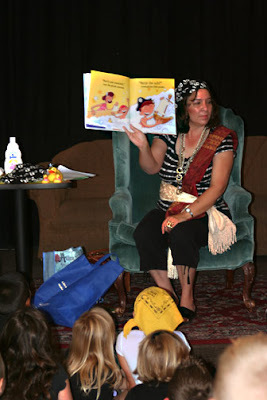 As you can see in the photos, the theme for her first Story Time was Buccaneer Bay-Pirates. (Arrrgh, Mateys. Julie read books such as That's Not My Pirate by Fiona Watts and Bubble Bath Pirates by Jarrett J. Krosoczka. She also took favorite songs like "The Wheels on the Bus" and changed the lyrics to "The Pirates on the Ship." The theme for the July 28 Story Time will be WILD for Animals! Julie invites children and grown-ups to come dressed up as their favorite animal. Show of hands. How many of you thought of Oklahoma!, the musical, right away? Good for you. But, did you know there is a Hollister, Oklahoma? I didn't know it existed until I did a google search for Oklahoma + Hollister. Hollister, OK is located in the southeast part of the state. But, that's something to talk about another day. Remember the film version of Oklahoma! with Gordon MacRae as Curly, Rod Steiger as Jud, and Shirley Jones as the girl those two guys wanted. Originally, it was a Rodgers and Hammerstein's production, which played on Broadway. This coming weekend, you can see that play in Hollister! For the past two weekends, the San Benito Stage Company has been presenting Oklahoma! at the Granada Theater. This weekend will be the company's last performances. Oklahoma! will be presented at 7 p.m. on Friday (July 23) and Saturday (July 24). On Sunday (July 25), you can see a matinee at 2 p.m. on Sunday. The Granada Theater is located on Fifth Street across from the City Hall. A portion of the ticket sales will be donated to the San Benito County Historical Society Garcia House Visitors Center. For more details, check out the San Benito Stage Company Web site. 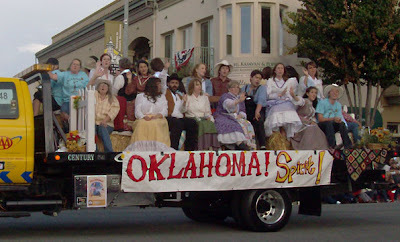 And, to read about the production, check out "'Oklahoma' comes sweeping into Granada" by Melissa Flores at Weekend Pinnacle Online. 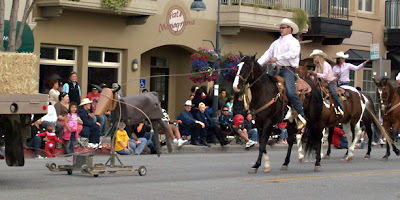 2010 San Benito County Saddle Horse Show and Rodeo Parade. 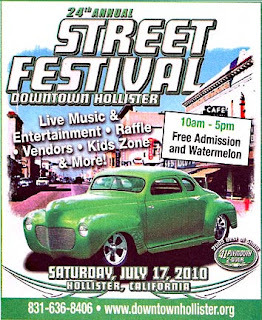 Among the ads in Tuesday's Hollister Freelance was an insert about the 24th Annual Street Festival this Saturday, July 17. Yes, I know I wrote about it yesterday. Just thought you'd like a few more details. San Benito Street will be closed between South and Fourth Streets. 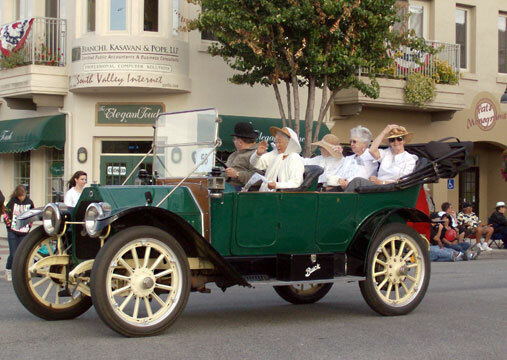 Classic cars will be on display up and down the street. According to the map, food vendors are by the Veterans Building and Vendor Row is on Fifth Street. Be sure to get your free slice of watermelon when you're there! I like it when San Benito Street closes through downtown Hollister. For one, that means something fun is going on. For another, that means I can stroll down the street. After a parade, it's right down the middle. Same thing with the Farmers Market, even though it's only one block and it's a side street. Yes, cheap thrills, indeed. This Saturday, July 17, you can stroll San Benito Street, from South to possibly Fourth, at the annual Downtown Hollister Street Festival. Number 24! You can ogle at snazzy vintage automobiles and the latest new ones, listen to live bands, watch live performances, take part in a raffle, eat, buy stuff, and so on. The event starts at 10 a.m. and ends at 5 p.m. For more details, check out this page at the Hollister Downtown Association Web site. P.S. Saturday is a very busy day and night around the area. Several events and activities are going on. If you're into it, you can combine a silent auction, an evening concert, a play, or other activities with the street fair. For a list of events, please click over to Goings On in July. One of the fun things about the Hollister Downtown Association Scavenger Hunt was learning about new businesses in town. Well, they were new to the husband and me. 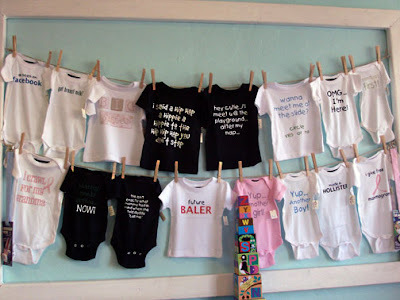 Dolce Baby and Mommy Too is one such store. That store is just cute, cute, cute! Cute is what that store is all about. Have I said that already? All those cute kiddie clothes in bright happy colors. I just smile thinking about the joy bounding through that store. 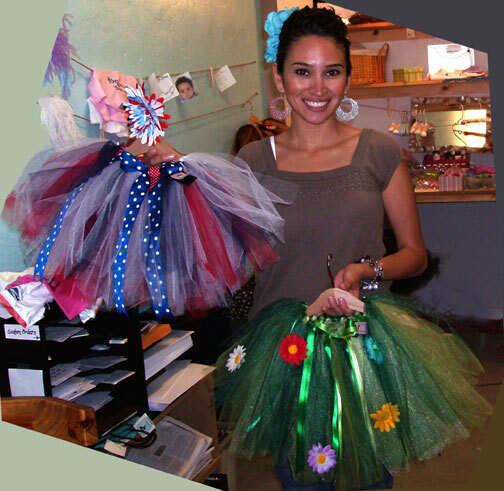 Aren't those tutus sooo cute? Veronica makes them special for customers. Our scavenger hunt card was checked by the lovely owner Veronica Fontanez, who is a Baler graduate. 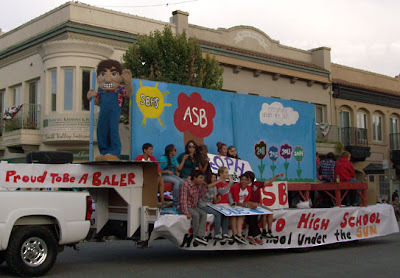 Go Balers! Veronica and her husband opened the shop in May. They were inspired by the birth of their own child. The Pinnacle News wrote a story about the opening. Click here ("New Store Dresses Young Kids in Style") to read it. 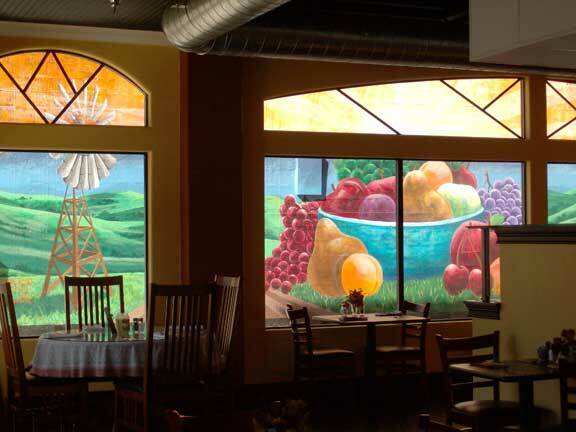 The next time your downtown, check out Dolce Baby and Mommy Too. It's on 748 San Benito Street, near the corner of South Street. The place was formerly the Thyme Deli and if I'm recalling rightly, way before that—during days gone by, it was a travel agency. Hope you all had a wonderful July Fourth weekend. Here are some doings for the month in and around San Benito County. You're welcome to add other events in the comments section. Thursday evenings: Movies Under the Stars, Hollister. Around dusk at the corner of San Benito and Fourth Streets. Bike Ride with Off the Chain Bikes, from 8 to 11 a.m.
July 2 to July 30: New York Duet Art Exhibit, Blak Sage Gallery, Hollister. Artists reception on July 9, from 4 to 7 p.m. Gallery hours, Tuesday through Saturday, 1 to 5 p.m.
July 8 to August 1: Corridos!, El Teatro Campesino, San Juan Bautista. 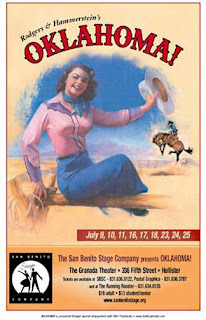 July 9 to 11, 16 to 18, 23 to 25: Oklahoma!, San Benito Stage Company, The Granada Theater, Hollister. July 10, 17, and 31: Fremont Peak Observatory Evening Public Program, Fremont Peak State Park. 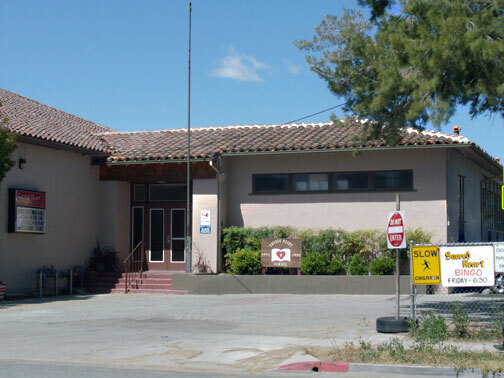 6:30 to 8:30 p.m.: Open Mic Night, San Benito County Free Library, Hollister. Poetry, music, and songs of all styles and languages. All ages welcome to participate. For more details, e-mail Joe Navarro at poetajoe (at) yahoo (dot) com. 6:30 to 8:30 p.m.: Pedro Card Party, San Juan Bautista. 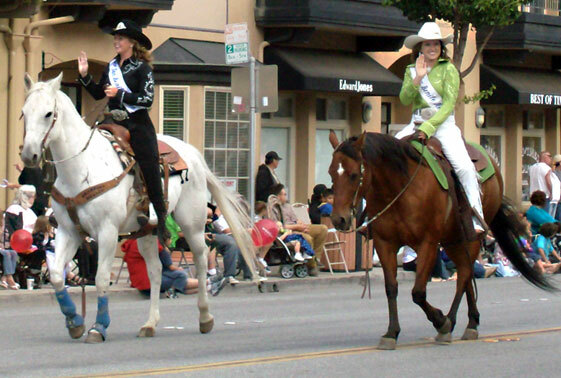 Sponsored by the Native Daughters of the Golden West, it will be held at 203 Fourth Street. Beginners are welcome. 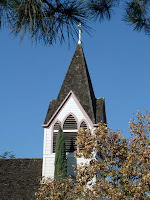 7 a.m. to 2 p.m.: Flea Market, Immaculate Conception Church parking lot, Tres Pinos. 1 to 7 p.m.: San Juan Bautista Gallery Walk, San Juan Bautista. 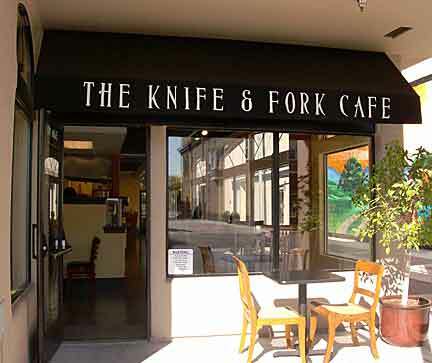 6 to 9 p.m.: Jazz with Luis Lenzi, Knife and Fork Café, Hollister. 9 to 11 p.m.: Pinnacles Star Party, Pinnacles National Monument. 9 a.m. to 3 p.m.: Monthly Antique and Collectibles Fair, San Juan Bautista. 10 a.m. to 5 p.m.: 24th Annual Street Festival and Car Show, Hollister. 12 noon to 3 p.m.: Fremont Peak Observatory Solar Program, Fremont Peak State Park. 1 to 5 p.m.: Class of 1971 Scholarship BBQ/Silent Auction Fundraiser, Veterans Park, Hollister. 6 to 10 p.m.: Dave Mason Concert, Guerra Cellars Summer Concerts, Hollister. 6:30 to 9:30 p.m.: Jazz Under the Stars, a benefit for the San Benito County Homeless Coalition, Hollister. Performance by the Magnolia Jazz Band. July 24: Jazz with Luis Lenzi, Knife and Fork Café, Hollister. 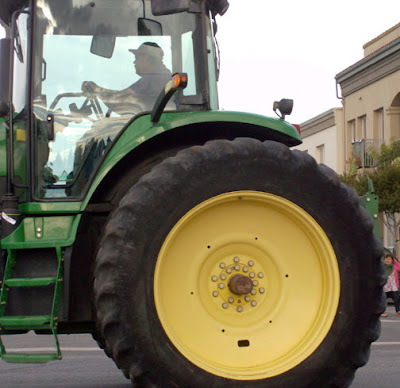 6 to 9 p.m.
July 30: "The Big Country," Movies in the Park series, San Juan Bautista. Sponsored by the Plaza History Association, the movie will be shown on the San Juan Bautista State Historical Park Plaza Lawn at sunset. Refreshments will be available for sale. July 31: Show ~n~ Shine and Swap Meet, Betabel Station Outdoor Market, San Juan Bautista. 7:30 a.m to 4 p.m.
July 31 to August 1: Relay for Life, American Cancer Society, San Benito High School, Hollister. The downtown summer night movies are back! This year, the Hollister Downtown Association will be holding the free movies every Thursday night in July. Bring your seats and blankets and find your place on the lawn at the corner of San Benito and Fourth Streets. Movies start half an hour after dusk. Some things to remember: Minors cannot attend the movies alone. Please leave your pets at home. No coolers or alcohol drinks are allowed at the movies. And, no smoking either. If you're hungry or just need something to munch as you watch, you can buy pizza, popcorn, and other refreshments there. 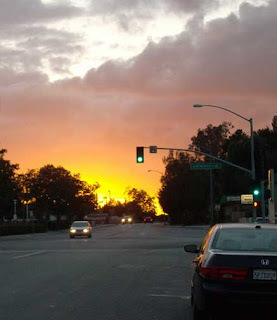 For more details, check out this page at the Hollister Downtown Association Web site. The 2010 San Benito County Saddle Horse Show and Rodeo was last weekend. Check out the following for stories and some photos of the event. If you know about other links, please leave them in the comments section. 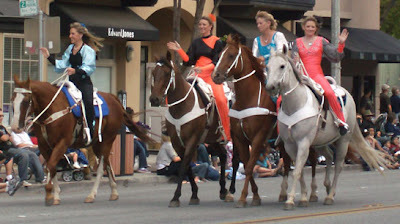 The parade, which opens the horse show and rodeo every year, was loads of fun. Participants included horsemen, equestrians, community groups, 4-H groups, school groups, baton twirlers, politicians, and more. Here are just a few photos from that Thursday evening. 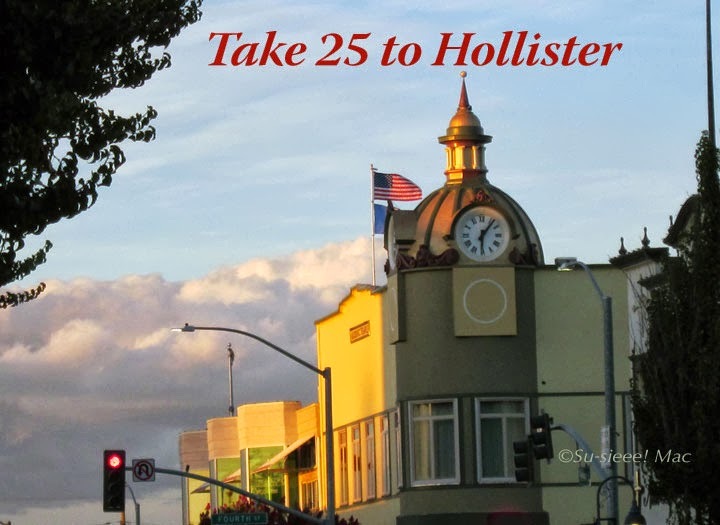 If you'd like to see more, head over to the Take 25 to Hollister page on Facebook. Wranglers took turns showing how to rope a cow. 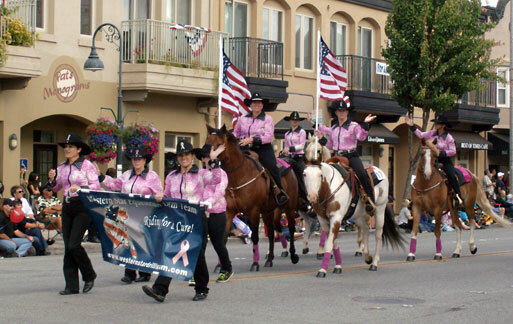 Equestrians showing their support for cancer research. 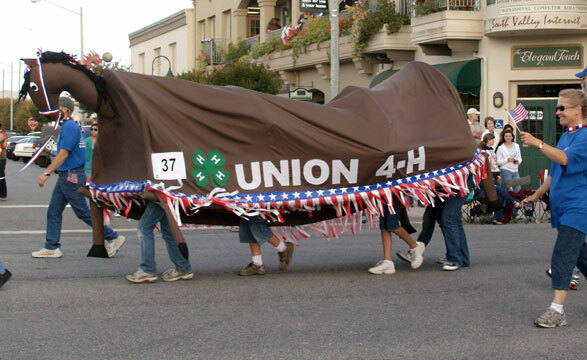 Union 4-H, one of the 4-H groups in the parade. San Benito County Supervisor, District 5. 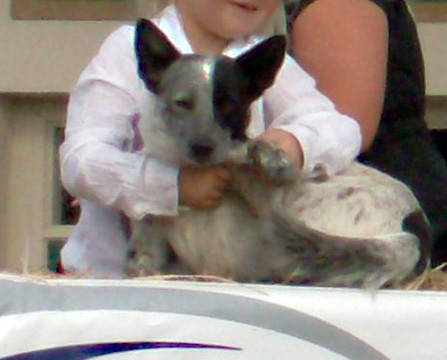 Even puppies wave "Hello" to the crowd.